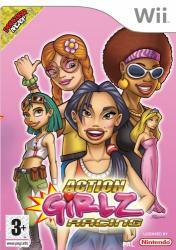 Meet Kat, an action girl with no fear � she will take anything on! She loves to hug the curves of every race track as close as she can, and is always the first to have a drink after the racing is over Latisha is so cool you have to check her for a pulse � nothing riles this girl! She knows her own mind and no one changes it � watch out for her, she�ll have no qualms about overtaking at speed. Bianca is all about being a professional � she has it all! She uses her head and thinks about every corner and pick-up on the track. But she isn�t all brains though, Bianca knows how to have fun & relax with her mates once the race is finished. Amber may come across like she�s more concerned about her looks but that�s only because she wants to win in style! Her image is important to her, but nothing compares to the feeling of winning. Akiko likes indie music and tap-dancing, hey every girl's different! But when it comes to racing she only thinks about the finish line, and will do whatever it takes to cross it first. Blossom harnesses flower-power like no other female � she�s really something, and her passionate yet relaxed personality makes her the ideal driver - all the other girls love her. Courtney is up there with Latisha for being the coolest chick around � but she�s not copying man, oh no, she�s got her own style. When she overtakes her competitors on the track, she knows she'll be seeing them L8er.